Super sweet vintage new born Baby Doll puppet in original box. This unique baby doll has a soft sculpted face and is called Kari Me Baby. Baby is in excellent, never played with condition. 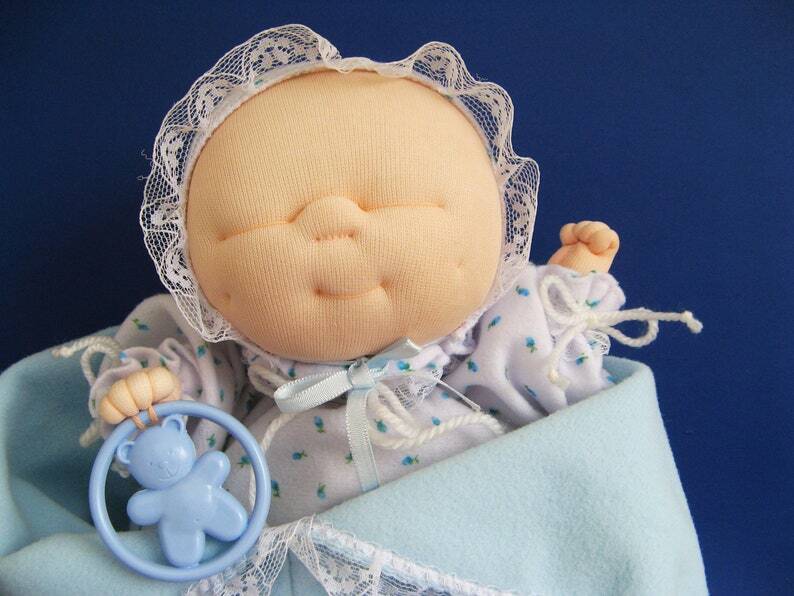 The sweet baby wears a gown & bonnet with blue rose buds & has a blue toy in hand. Baby is tucked into a blue blanket. Children can put their hand hands inside the blanket & make the baby move. Comes with a check certificate for one thousand hugs and kisses. Kari Me Baby is designed by Marilyn DePew and made by Fun Farm by Dakin. Box is in fair condition with some wear and loose plastic. Make me move. I'm like a real baby. So soft and cuddly, it becomes a part of you. Kari-Me Baby's little arms, hands and head move like a real baby's. Share your love with Kari-Me Baby. Safety Tested. Suitable for all ages. Surface washable-use lukewarm water and mild soap.